Move with us by your side and learn what moving with a smile on your face is all about. Your safety and satisfaction are what matters most. DA Moving was founded in 2013 as a "Man with a Van" moving service. 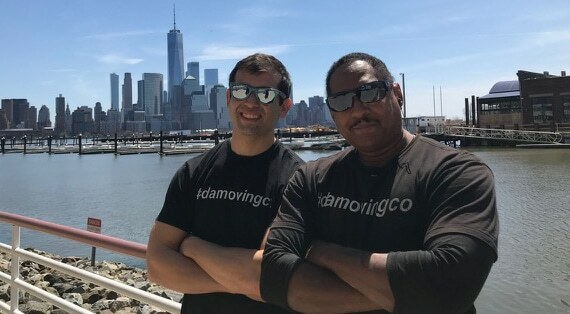 Today, we have expanded our business and now provide a full service moving experience, from a small single item delivery to an entire household in and around New York City. Our hard work and dedication has earned us a 5 star Yelp! rating. We are fully licensed and insured movers. We also provide a Certificate of Insurance (COI) upon request. Contact us to arrange your next move or delivery. Diego and Mark were AWESOME for our move from NYC to upstate. They came right on time at 8am, finished dissembling and moving our furniture into the truck by 9am, and promptly met us upstate. They took less than an hour to move everything into our new home. We would recommend Diego and his team to everyone. Thank you for your hard work! I didn’t know moving can be so fun and stress-free until I met these guys! And hiring them was more than a good idea. They arrived on time and finished the job just the way we like it. Also, they took every possible precaution in order to ensure our belongings’ safety. Keep up the good work guys! We will call you the next time we decide to move!